With its savoir-faire in the manufacture of steel blades and a desire to enhance everyday life, Peugeot offers a collection where each kitchen knife is designed with functionality and aesthetics in mind. Santoku 19 cm - 7,5in. 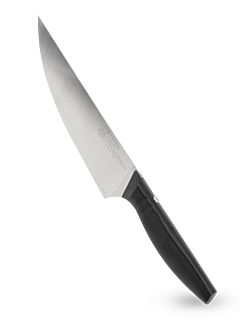 Chef’s knife 20 cm - 8in. Chef’s knife 15 cm - 6in. Bread knife 22 cm - 8,75in. Peugeot offers an exclusive collection in which each kitchen knife is designed for both demanding professionals and home cooks. 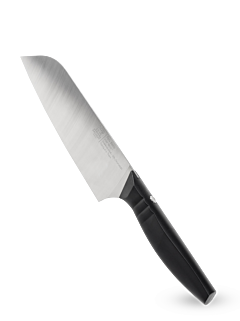 Entirely made in Thiers, home of fine French cutlery, each kitchen knife features a solid, hard-wearing blade that performs to perfection. They are cut or forged (depending on the range) in an exclusive steel alloy with high chromium content that guarantees increased protection against corrosion. Each blade is hard-wearing, no matter how many times it's been sharpened and meets the cutting requirements of every type of ingredient. Peugeot has developed and enhanced the art of cutlery with a savoir-faire into which it has integrated its identity and its aesthetic choices, always with the aim of offering a professional kitchen knife that's accessible to everyone, designed to be used, and perfected by design.